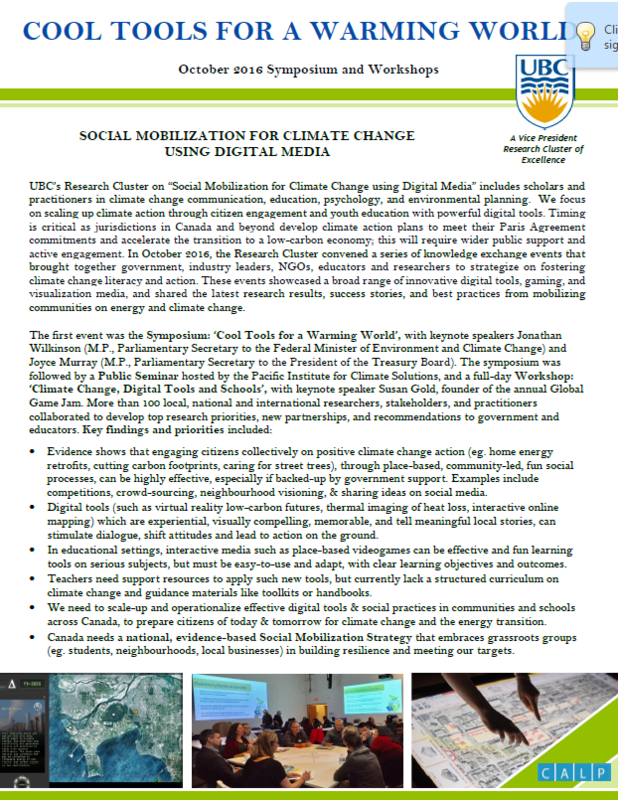 This free public seminar showcased innovative digital media and success stories for climate change education, planning, and action. Leading experts demoed interactive visual tools and shared new research findings on what works in building climate change awareness and fostering community-led action. The event was hosted by UBC’s Collaborative for Advanced Landscape Planning (CALP) in partnership with the Pacific Institute for Climate Solutions (PICS) at UBC Robson Square. This symposium for educators, industry, government, youth leaders, and scholars, demonstrated and shared projects that are underway to communicate climate change through a range of compelling digital tools, including video games, augmented reality, thermal imaging, and citizen science and more. The objective was to develop strategies for scaling up community engagement on climate change. Here participants learned about research outcomes and took part in developing next steps for a new research cluster. The Symposium was held at UBC’s BC Hydro Theater and is supported by UBC Vice President Research + International Office. 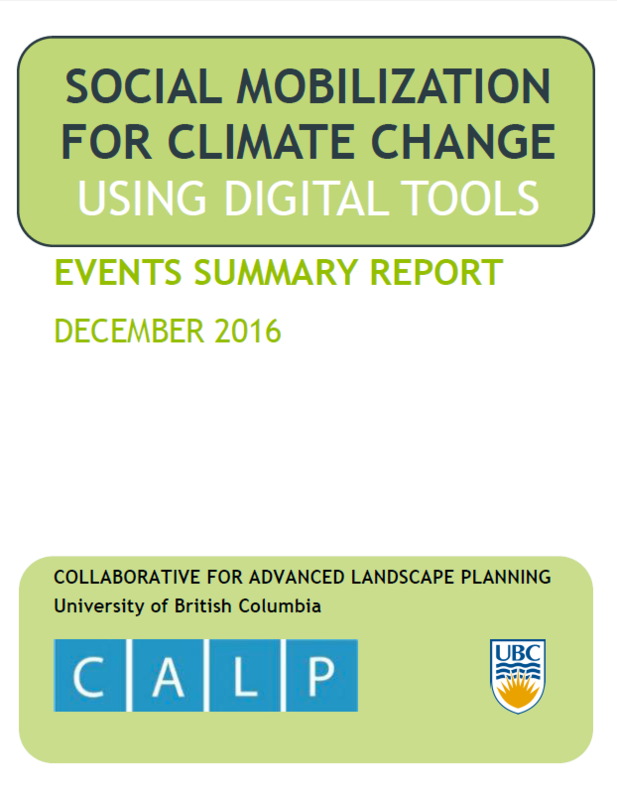 For an overview of some recent research results on social mobilization using digital media to engage 3000 people in BC, please see http://pics.uvic.ca/synthesis-pics-funded-social-mobilization-research. This workshop focused on educational video games and teachers’ needs, including a morning panel session and brief presentations by new and existing partners of the Future Delta 2.0 video game project. Participants learned specific research findings on what works and what doesn’t in climate change education with place-based experiential games, and heard from experts on the topics of gaming for the purposes of education, climate change communication, and youth engagement. An innovation session was held in the afternoon, where participants explored possible new ways of engaging youth on relevant climate change issues using digital tools, and conceptualize needed instructional resources for using games, aimed at teachers and youth groups. The workshop was held at UBC’s BC Hydro Theater and is supported by Social Sciences and Humanities Research Council (SSHRC).